Capture stunning high-resolutions pictures and vibrant HD video with the latest touchscreen-operated offering from Canon – the remarkable EOS 650D. Packing 18 megapixels and capable of shooting full resolution images at 5 frames-per-second, new features that make photography more accessible and an impressive multi-touch screen –it's quite apparent that the new Canon, can indeed. 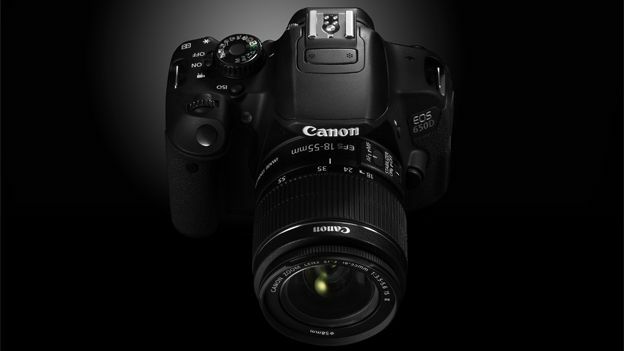 The EOS 650D is the first entry-level Canon camera fuelled by the company's impressive DIGIC 5 processor. It offers greater speed and is ideal for capturing fast-paced sports. The most exciting feature of the new Canon are the 3 inches of multi-touch gesture LCD that allows budding photographers to press, pinch and swipe through menus, playback footage, autofocus, track faces and even take a photo. It is evident that the touchscreen is a powerful and essential part of this camera and should provide a nice alternative to squinting through the viewfinder. Capturing full 1080p will be a joy on the Canon EOS 650D which continuously tracks subjects and autofocuses on the action. This makes this professional-looking camera accessible to anyone with the ability to aim the lens and with in-camera clip-reordering and a HDMI output, the fruits of your inner-Spielberg can be shared to any HDTV instantly. This new accessibility is a feature that runs deep within the camera and is most obvious in 'Scene Intelligent Auto Mode' which automatically selects the optimum settings for the environment – this means that there is no need to labour through the menus, searching out the best options for your photo. Finally, being a Canon the EOS 650D is compatible with over 60 different lenses and more accessories. Available from the 15th June, the Canon EOS 650D will retail from £699.99 up to a little over £1K. Also, there is a nifty Camera Bag bundled if you order before August.